Hello everyone! çʊʈɛpɪɳkɣ is the name I go by on Scratch. 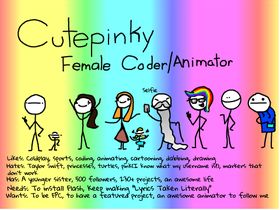 I'm a female coder who enjoys animating, cartooning, drawing & listening to music. I'm proud of my work on Scratch since 02/07/14. you. I know. Creepy, huh? @Jellybeantwist´s 100 Spectacular Follower Studio!! !